Website designed and maintained by the Portsmouth Music Experience. Back in the days when the Guildhall was an austere building full of council staff, who would have thought one day it would be managed by a Cultural Trust who would open it up for community events and allow a large exhibition area dedicated to local music, clubs, pubs and venues, a 9' painted roundel and a Lambretta TV 175 on display on the first floor. 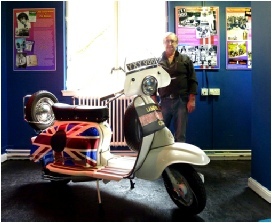 The 1960s gallery section of the Portsmouth Pop Music Experience at the Guildhall has a new exhibit - a Lambretta TV 175, Series 2, on loan from Brian Masterton who was an art student at Portsmouth College of Art & Design back in the 1960s. 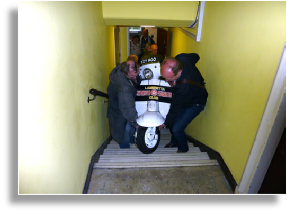 It is a replica of his original scooter, which he still regularly rides around the area and to scooter festivals as far away as Scotland. 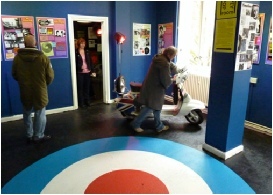 Brian has painstakingly re-built and re-sprayed the replica scooter to an ‘as new’ condition. 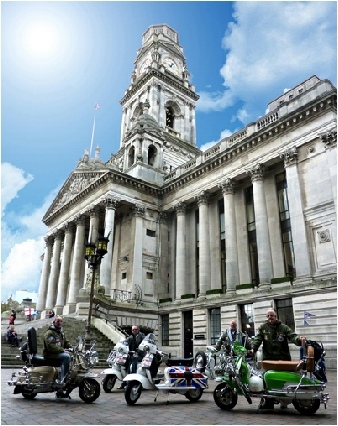 Brian’s story, and that of the Portsmouth Federation Scooter Club, who used to meet in Twyford Avenue, are illustrated on the two newest display panels to be added to the exhibition. 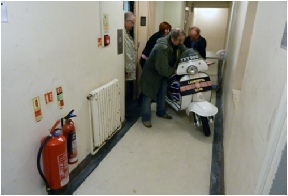 The scooter arrived on a trailer, escorted by other Lambretta owners, some coming from the New Forest and Basingstoke areas, and a journalist from Scooterist Scene magazine. 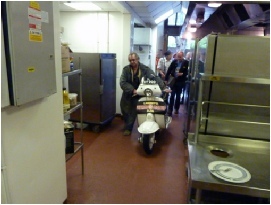 Getting the scooter up to the exhibition involved a push up the ramp into the kitchen, past the ovens, into the service lift to the first floor, then along a corridor, before being lifted up a flight of steps to get it up to the exhibition level. There were many visitors to the exhibition looking on while it was being installed, including a nine year old girl who added her appreciation to the visitors book - ‘I love the red, white and blue motor bike. The place is set out neatly and I think it should cost money! 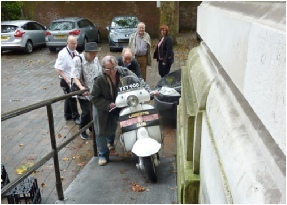 Some of the scooters that accompanied Brian’s Lambretta on its journey to the Guildhall.